My husband bought me Mama, PhD as a graduation gift. He thought I would appreciate the stories about “motherhood and academic life.” In under a week, I tore through the anthology. Divided into four sections, the editors captured women’s stories about “The Conversation” whether to start a family, “That Mommy Thing” that competes with more scholarly pursuits, how “Recovering Academic[s]” fare after becoming parents, and the “Momifesto” that women create for themselves to guide their own professional and personal lives. I felt comforted to read memoirs of women’s lives as they described their worry in revealing their pregnancy to their advisory committee, the schlepping and physical challenges of being pregnant on a big college campus, the swell of support or the lack thereof from different significant others in their lives, and the realization that life would never be the same after becoming a mother. Each vignette was short, and I found myself devouring several at a time. After I finished each one, I was inspired to write my own Mama, PhD essay–that’s in the works for some time next week when I finish it. A few things about the anthology trouble me, though. Originally published in 2008 (though some essays have appeared elsewhere before publication here), the anthology documents women’s experiences in the academy in the 1970s, 1980s, 1990s, and 2000s, and the differences are nearly unrecognizable. As children of academics in the 1970s or as expectant mothers in the 1990s and 2000s, the essayists describe their struggle to “balance” professional and personal lives at the expense of their relationships and employment opportunities. To think that no progress has been made on family leave policies (not just maternity leave because parenthood does not simply involve mothers) is terribly disheartening. My experiences negotiating maternity benefits in 2009 and 2011 sound remarkably like the experiences women shared over twenty years ago. My own graduate institution’s simple statement on graduate student maternity leave is largely hidden from students, and if you discover it, there is no guarantee that your department will honor it. My first daughter was due during spring break, born early March, and I was lucky that my assistantship assignments for the semester were mostly flexible. I proctored a midterm three days before I was due, graded those exams while I was in labor, and three weeks postpartum juggled childcare to return to campus once a week for a seminar taught outside of my department. For my second daughter, however, due over the summer (a “perfect academic baby” many told me), the benefits did not apply because graduate students are not paid during the summer. A few weeks after my second daughter was born, my office mate welcomed his first child and as a new dad, he received no consideration for leave to be there for his family. Besides the lack of flexibility and support for growing families, I was also troubled by the extreme guilt and shame felt by so many of these soon-to-be and new mothers. Essay after essay, women described their drive to be academic “superstars” and their disillusionment about the true demands of parenting very young children. While I felt similar disillusionment when my oldest daughter was born, thinking I would be able to attend a conference several states away to present a paper ten days after she was born, I was never disillusioned about the importance of family life for myself and someday hoping for children of my own. I married my husband two months before I started my graduate program, and we knew we wanted to start a family in the coming years. I also knew that starting graduate school six years after receiving my bachelor’s degree meant that waiting until “after tenure” (and that’s if tenure ever even happened) was not an option. As the disillusioned mothers professed their experiences, I was troubled to read about the traps other scholars set for academic parents. Even if new mothers felt dedicated to their scholarly research, their advisory committees or their colleagues discounted their work, questioned their dedication, or simply “parent tracked” them. Like these essayists, I worried about telling my advisory committee that I was expecting a second child when I was in the throes of putting together my first (failed) dissertation proposal. I did not want them to give up on me or ignore me. I was determined to finish my dissertation project because I could not walk away. No birthing classes or first-aid lecture can prepare you for how hard those first few months of parenting will be as competing feelings of pride, fear, love, hope, and despair overwhelm your heart. Your body fails you, your mind fails you, you fail your partner, and you feel really, really tired. But you also discover inner strength and resolve, the dark days pass, and your expectations about everything change. I do not question for one second the decision to become a mother when I did. Unlike some of the essayists, I do not feel ambivalent, shameful or guilty about my decision to be a mother. I know I may be perceived as less serious, but I feel no less serious about my research agenda. I am still unsure of my next professional move, and even if it does not involve the tenure-track, I am still planning on using the skills I developed conducting and presenting my research. You may be thinking that all of this is simply anecdotal evidence. Sadly, new research confirms that women suffer a penalty for trying to have a family and an academic career. In their new book, Do Babies Matter?, Mary Ann Mason, Nicholas Wolfinger, and Marc Goulden describe the “baby penalty” that affects female scholars’ wages, their job security, and their engagement in the academic labor market at every phase of their careers. A newer collection of essays out this month, Mothers in Academia, edited by Maria Castaneda and Kirsten Isgro, piles on similar frustration and disappointment about women’s work and life “balance” in academe. I am not sure if I have been “parent tracked” but I do know that my family is important to me, and decisions about my or my husband’s professional lives will always take the well-being of our family and our marriage into account. We would not choose to have jobs that forced us apart, we want to remain close to our extended family if we can, and we want our children to have both of us present in their everyday lives. If that means that I make deliberate professional choices and pursue non-tenure-track or alternative-academic opportunities, I feel comfortable with that arrangement. This entry was posted in academia, family, fatherhood, gender equality, grad school, higher education, kids, lessons learned, marriage, motherhood, parenthood, reading, women, work, writing. Bookmark the permalink. Have u read lean in? Worth it. Hugs. Fathers are supposed to get (? )paid family leave according to federal law. This is new as of about 20 years ago. There are actually some employers with onsite daycare now, but when I suggested it at as a way to attract and keep women docs at Kaiser, it was apparently not good for “the bottom line.” They recently have adopted a policy that helps with childcare for sick children. Very slow progress. Things have changed some since my mom decided to marry a doctor instead of becoming one. If she’d become a doc, she’d probably have had to choose no marriage and family. Men were scarce during WWII so she chose marriage. Your mom is quite the trail-blazer and she raised four very progressive ladies. Change is incremental, right? I hope so, for my own daughters’ sake. I’m glad you found the book, and thank you for your thoughtful response. I am as disheartened as you that so little has changed since the book was published/since the stories took place. I wish you all the best with your family and your career. Caroline, THANK YOU for your comment! I really did enjoy the anthology even though it felt frustrating at times (for the women and for the system). Your story resonated with me really deeply–so much so, that I had to put it down and look you up to make sure my own career and family life could survive as peacefully as you described your post-baby decisions. I am hoping to pitch something to Literary Mama soon. Thanks again for reading! Thank you for posting this!!! As an in college parent it really gave me a needed boost! So glad you enjoyed it–thank you for reading! A fascinating post, thank you. I am also a sociologist and have a PhD but unfortunately have hit a wall, due largely to the economic recession, where securing employment that is related to my qualifications is virtually impossible. I reckon if I were not a mother and free to travel to wherever in the world the work took me, all would be okay but life isn’t as simple as that when children are part of the equation. I think there is an assumption, too, that once a child starts school, he/she is basically ‘independent.’ The possibility of ‘children/teenagers’ developing chronic illnesses is certainly not factored in very often as a variable which may have huge implications for academic careers and as a medical sociologist, I suggest it most certainly should be. I wonder about the competition for jobs, too. Even if you could move anywhere and you were “independent,” that still does not guarantee you a position. And if not parenthood, other personal circumstances can get in the way of your professional life. Except when you’re on the tenure-track, it’s like there’s no exit strategy if life gets in the way. I needed this right now. Am in the final stages of my own doctoral program and am struggling to keep the timeframe. Mahalo. It’s encouraging to know that other women have succeeded in both areas of their life. Stay strong! Those final stages can be really tough. I wrote an essay earlier this year as I put together the last draft of my dissertation called “Surfacing” that you might appreciate, too. Hang in there! I’ll go check out the Surfacing essay. Mahalo! I think it’s sad that women are sometimes forced to choose and often times encouraged to choose between having a career and being an academic. It just seems sexist, especially because I don’t feel men have this same problem. Family leave policy is an issue close to my heart. Changing that policy could radically change our economy for the better! Great post. I could not agree more. It’s good economic and social policy to promote happy families! thank you for this post! I have a PhD and put off having kids until after grad school/post grad/etc. I absolutely adore my kids – but I am 41 with a 2 yr old. So, I tell my 10yo daughter to plan her career (if she chooses to work) around being a wife and mother first. That’s what matters most! That’s always the conundrum–do I wait or not? Having my family changed everything about my professional life. Thanks for reading! I guess it depends on the individual. I’m twenty, in college and I’m planning to do a Masters and a PhD after I complete my B.A. My career goal is to become a professor of linguistics. I love academia and I thrive on a college environment; I am absolutely sure that I want an academic career and that is top of my list. Although it’s obviously very early for me to be thinking about it, I have thought about the difficulties of balancing my career goals and a family life. It is extremely disappointing that, in this day and age, “women suffer a penalty for trying to have a family and an academic career”. If it’s still like that when the time comes for me to decide, I’ll have some hard choices to make. You’re probably already connected to some professors in your institution but be sure to ask them about their experiences navigating these kinds of decisions. I know when I was an undergraduate, I was in no hurry to start a family. When I started graduate school several years later, I still did not have a sense of the work/life balance issue for academics in general and academic parents specifically. But, your priorities may shift or change altogether as you finish your degree and begin graduate school or head to work. I know that having children changed my views on work in a way I never could have imagined. I appreciate your reading of the post and hearing my point of view! Thanks for making me think a little tonight and congrats on being Freshly Pressed! And “having it all” varies from person to person (and across time), right? Thanks for reading–so glad the post got you thinking! Unfortunately, with the lack of progress politically as well as culturally for women’s issues it may be we need to simply rethink parenthood altogether. We would need to divorce ourselves from the notion about parenting as the purpose of our lives or fulfillment of our marriages or partnerships so that it can truly be an option and not the only path. Very insightful post. Although I don’t want to discount the experiences and data you describe, I did notice you mentioned that your male office-mate also received no consideration for leave for being a new dad. Obviously the lack of flexibility affects women more, but I think some blame for this problem has to be placed on the unrealistic, un-family-friendly structures of academic work in general. I could not agree more. Thanks for reading! It’s rather depressing to think that things haven’t changed much in over 20 years, but I believe that’s true. And yet … universities/colleges could provide on-campus nurseries/crèches/after school clubs for the children of their staff. It would ease the burden and pressure enormously. Is that suggestion just too simple? The availability of childcare is very important. I also think that the academic schedule and the demands of tenure are pretty unforgiving. The former is an easier fix than the latter of course. Thanks for reading! Thanks for reading–I hope you enjoy the book recommendations! The health of a society depends on the health of families.Proper child care centers should be set up by Govt as well as private organisations to help working mothers.’.Maternity leave’ not only benefits the mother and the child concerned but also the family and the society at large.So men should not be jealous of women who avail maternity leave.A great post indeed! Spoken like a sociologist! I think “family leave” is a concept many have trouble grasping. Families take shape in many different ways and at the beginning, every new family needs time to bond, connect, and establish their lives. Thank you for reading! I love your post and appreciate you sharing your story! I often wonder what it would be like if I went back to school with children and if I decided on expanding our family. I think I was a little disillusioned at how much my husband would be able to assist. Not because when he was there he wasn’t helpful it was simply that the company had a lousy excuse for maternity leave. He basically had to tell his boss that he had to take off work (as they had previously agreed!) and had to fight for it. Hopefully it gets better for women and men as birth and recovery can be difficult. Being able to “bounce back” is expected too fast for too many. The balance of work is certainly a juggling act and everyone’s experiences will be different. I was disillusioned at the whole start of parenthood and try to be easy on myself so I can be a model for my children and my students. Another commenter said we’re trying to have “the good life” and that’s how I think of it. “Having it all” is a lot of pressure. I’m satisfied with just enough. Thanks for reading! Thank you so much for reading–I could not agree more! It takes many, many scholars who want families and professional lives to push for incremental changes. Women are life’s force. Therefore, we can do it all. I salute all of you for your goal oriented determination. Hopefully the mindsets will change. In the meantime we cannot stop writing about it. The same applies, too, in my country… My contract as an elementary schoolteacher was not renewed after my first child was born even if I was never absent after his birth. I found another job in another prestigious school and got pregnant two years later. My contract was also not renewed despite my best performance. I had struggled to find out why it was done to me twice – having been replaced by a single woman and a woman who had no children. Only in the present did I realize that perhaps it was because I would be seeking free tuition benefits for my children later on. No regrets, though, I think it would have stunted my growth as a person and a professional if I had to work in the same place all my life just so that my kids would have free tuition. I would have been indebted to an institution and it would have been the death of my spirit. If we view our experiences as a path in progress rather than a thwarted plan, it is much easier to be at peace with our present circumstances. I appreciate your strength facing this injustice in your school! All our efforts as humans call for balance. No one ever has it all. There is nothing wrong with someone pursuing a career whilst balancing familial obligations. Equally if a woman decides to suspend work in our traditional sense for the joys of being home with her kids, kudos to her. And “traditional” is socially constructed. Maybe in another twenty or thirty years, it will be normative for all families to have work/life balance. I am right there with you. I’m currently pursuing post grad studies away from my kids and this adds another layer to the debate. You are right–this adds further complication to parenting. I hope that with technology that you are able to connect often. Thanks for bringing that issue up and for reading the post! Interesting perspective on a complex topic. Thanks for sharing my essay! You are welcome. I really enjoyed reading it, and it resonated with me at many levels. Back on blogging, back from R&R and just found this great piece! Loved her final comment, and felt so related to it! Family life is important. More important than your/our [original] career decisions… once one’s got a family, decisions and changes in life need to take that into consideration! 😮 I myself remember being so afraid/concern to tell my [then] Post-Doct advisor on my [first] pregnancy, and fearing for his reactions… After that, life has taken us to many different places, and for sure, my career has changed. Quite a bit, I’d say. And I’m happy with that. I’m satisfied with the decisions we’ve made for our growing children, under the circumstances of being a ‘nomad couple’ with the Foreign Service. I was in this boat as well. I had my first child while getting my masters degree. I look back and have no idea how I made it through! My husband traveled Monday through Friday and I was in school 40+ hours a week. I had to go on bed rest which was very difficult. I had three weeks off because it was spring break when my little guy was born and went right back to school. The guilt of putting him into daycare from 6-6 was horrible. I would not want anyone to go through that! I went on to get my doctorate when pregnant with my third. My original plan was to teach but life had different plan-sort of. I am teaching, but I am teaching my own kids as I homeschool them! Not quite the same as teaching at the college level but much more rewarding! Thank you for sharing! SO happy that you’re rolling with your current plan. We recently discovered our toddler’s preschool teacher (a woman who recently joined the school staff with teenage/college-age kids of her own) has a PhD in psychology and finds teaching our toddlers more fulfilling than teaching college students. Not sure teaching preschool was her plan but she is fully engaged in teaching just in a new and exciting venture. Thank you for reading! An interesting and well written article Raquel. 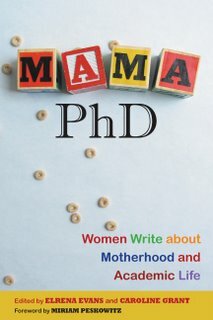 This is an interesting book review of “Mama PhD”. Those of you who may appreciate the struggles of motherhood and academic life will enjoy this book or at least find it interesting. Check it out! I enjoyed reading this my very first blog. MAny thanks. Meant to say: Thanks for sharing! Very eye-opening. All the best to you and your family! I think reading about others’ experiences is helpful, but it can also be scary. Just be prepared to question (deeply) your personal and professional aspirations. No matter how steadfast you think your goals might be (to become a professor, a professional or a parent), children are a game-changer (the best kind of game-changer in my opinion). And know that whatever you choose, it will be the right thing for you even if others pass judgment. Putting your family first is so important. Academic life can be hard on a family (I come from a line of academics). I was preparing for an academic career but after having my kids and finishing my PhD, I decided to stay home, that it wasn’t for me. I will find other ways to put my education to use. Best wishes! Thank you for this! I want my daughter to see me defend my PhD so that she knows family and professional lives are compatible for women. The more positive role models we can provide (and the nicer we are to each other as PhD Mamas) the better it will be for our little ones if they choose a similar path. Stay strong! Wow earning a PhD that had to be a lot of work but, I know that it was worth the effort. I wish I could earn a PhD but, I don’t think a PhD in Economics is necessary for me to pursue at this moment in time. I am currently a masters student applying for PhD programs and have two very small children. I am top of my class, and always have been, however, I will never hear the end of people in the academic world telling me how I am going to fail simply because I have children… It is very disheartening. It IS disheartening that others equate children with a lack of success. It’s all relative. Stay strong! Thanks for sharing this! Always good to hear more academic mom voices.